This massive body of excess water as well as the rise in overall water levels is swallowing parts of the city. 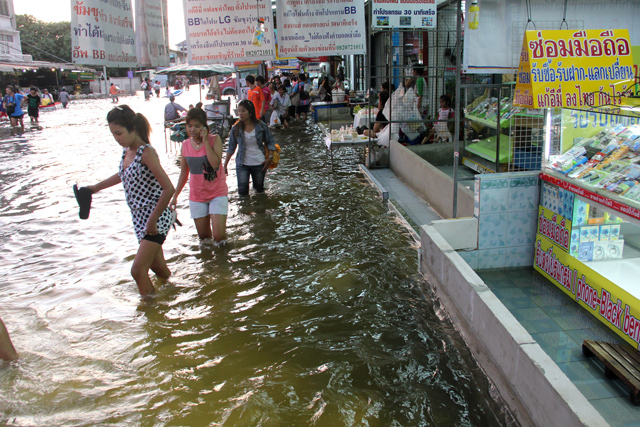 The city of Bangkok and its residents are on edge. Yet even though millions of people are affected directly or indirectly, there are still many within the city that barely notice a sign of the flood. As of now, my little studio apartment on the 3rd floor has been completely unaffected. I still have electricity, fresh water, and there's no stagnant water that I have to wade through to leave or come. The street food stalls still serve up their delicious dishes throughout the day and night, and cars, buses and motorcycles zoom through as usual. But if you look around my neighborhood a little more closely, you'll notice walls built around businesses, sandbags piled in front of stores, and an abnormal amount of boats sitting in front of people's homes. I walk into the nearest supermarket and the shelves are more and more empty by the day. There are still things to buy, but the extra stock of quantity that we're so used to seeing has dwindled away. 7-Eleven convenience store has been out of bottled water for weeks now (and even beer). Other beverages and certain snacks have also disappeared from shelves throughout Bangkok. I wake up in the morning, peer off the edge of my balcony and look down the road to see if my soi (neighborhood street) has been drowned by the rising water levels. Everyday so far it has been clear. But such is not the case in so many parts of Bangkok. With no television in my apartment I get on Twitter and check the #ThaiFloodEng feed for latest updates about the situation. Today I went to the giant wholesale fresh market, where I go to buy fruits and vegetables. It was dry just 3 days ago when I had went, but today the lower parts of the market were flooded with up to a foot of water. So I guess the question arises, should I still travel to Thailand now? As of now Bangkok's main international airport is open and functioning as usual. Officials seem to be doing everything they can to protect it from water. However there's only so much that humans can do to divert a giant amount of water. 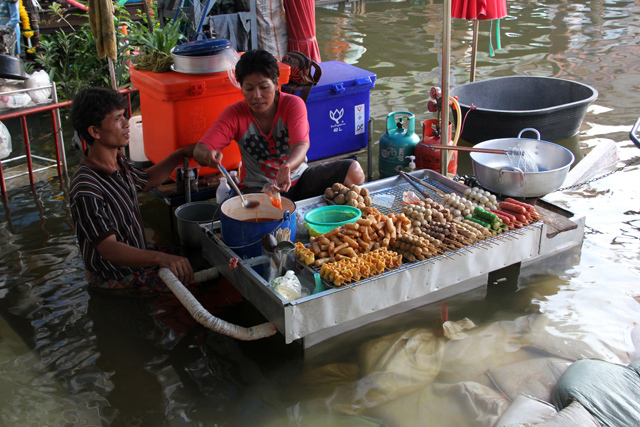 While quite a lot of Bangkok continues to be affected by floods, there are still many parts that go on as normal. 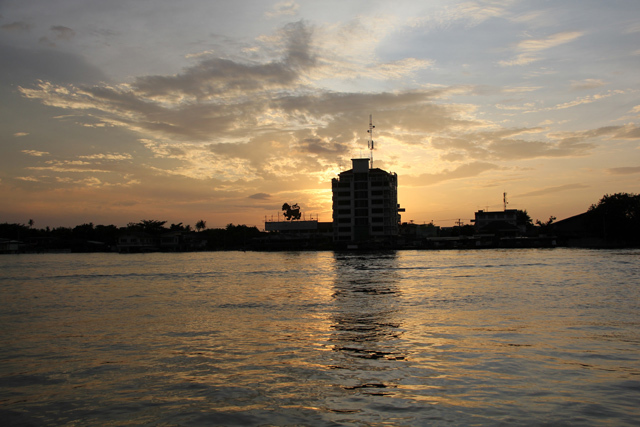 Many of the popular tourist things to do in Bangkok and central business areas remain open but low areas and areas near the Chao Phraya river and canals have really been hit hard. Everyone's a little more tense and no one knows exactly what will happen, or when this flood will be over. So it's still possible to visit Bangkok, but at the moment it's just not the same as it was a month ago. 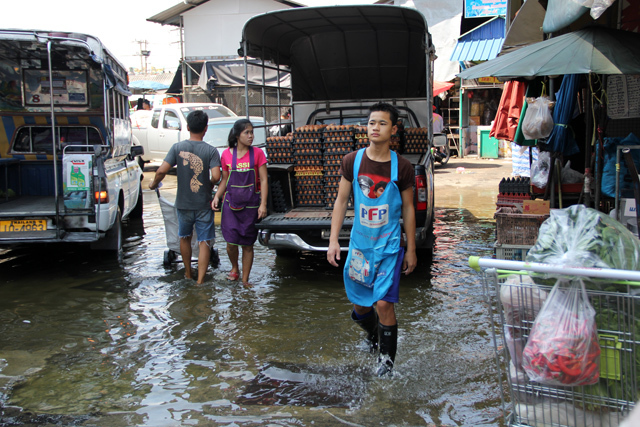 While I wouldn't fully recommend visiting Bangkok, there are still plenty of other places in the country like Chiang Mai or Krabi that are completely unaffected by the flood. 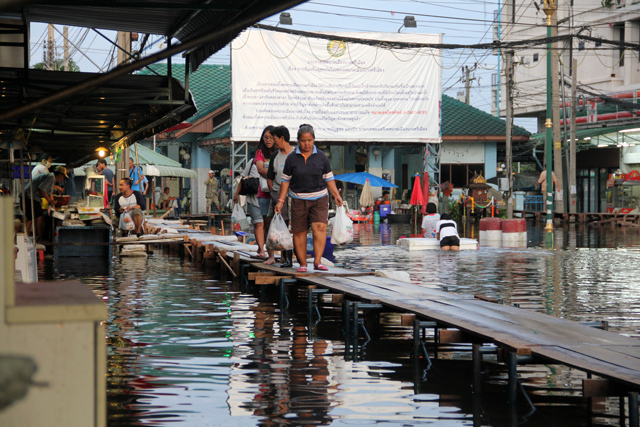 For over a month now the residents of Bangkok have been fighting the flood, dealing with its consequence, or just waiting around to see where to the water will go next. So as I sit in my apartment scrolling through Twitter, I can only hope that the situation in other parts of town improves, that water levels begin to recede and that residents of Bangkok can soon get back to their lives.